From debut feature director Paul Katis and writer Tom Williams (Chalet Girl) comes “Kilo Two Bravo”, a portrait of a harrowing real life event in the midst of the Afghanistan conflict, and a modern British war film. 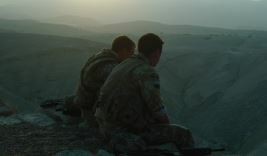 The film depicts an incident involving a group of soldiers, mostly from the British Army’s 3rd Battalion, The Parachute Regiment (3 Para), who were trapped in a minefield while stationed at the Kajaki Dam in Afghanistan in 2006. A small unit of soldiers is dug into a ridge overlooking the dam. A three-man patrol sets out to disable a Taliban roadblock. In a dried out river bed at the foot of the ridge, one of the patrol detonates a land mine, blowing off his leg and setting into motion a desperate rescue mission. His fellow soldiers come to his aid, only to find themselves trapped in an unmarked minefield, a relic of the Russian invasion of the 1980s. With no way out, any movement risks certain injury and possible death. Out of this harrowing day came extraordinary tales of bravery, selflessness and heroism, but also tragic consequences, for leader Corporal Mark Wright and his comrades, who risked their own lives to help each other.